The second collaboration between filmmaker Drake Doremus and actress Felicity Jones, Breathe In is about a homesick foreign exchange student who moves in with an American family and finds herself getting too close to music teacher Keith (Guy Pearce). 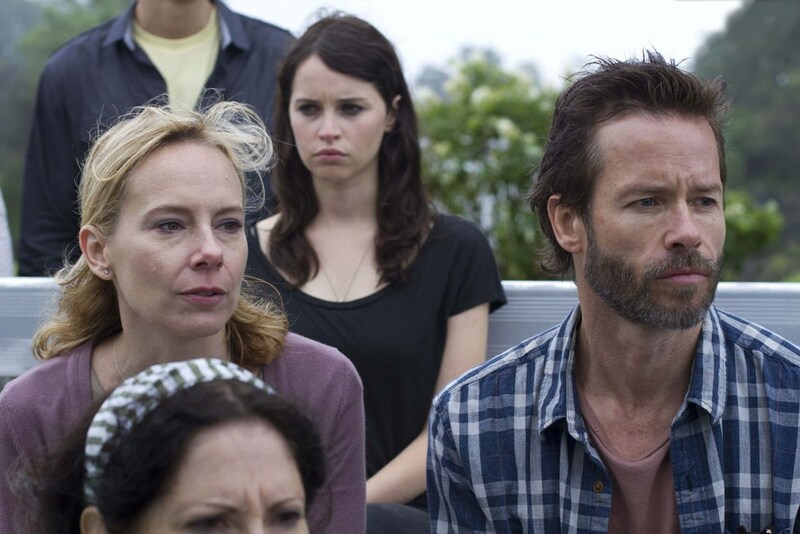 As with Felicity and Drake’s first film together – 2011’s Sundance-winning Like Crazy – Breathe In is entirely improvised, its naturalistic tone helping it avoid the clutches of melodrama. Despite being only 29, Felicity is a veteran in the industry, having acted for almost two decades. Ahead of Breathe In’s release today, we chatted to her about the film and her long career in acting. You’ve been an actress since you were a child. Has the way you approach it changed? It’s changed constantly. When you’re acting as a child you don’t really know what you’re doing, you just sort of have an instinct. It was something I enjoyed doing and it came quite naturally, but in a way when you become an adult you have to forget that you ever acted before. You want to find a new way of working – as a child actor you’re just being told what to do, and then when you’re an adult you realise that the best actors don’t wait for instruction. If someone comes up with a better idea you’ll take it, but first you must have a strong idea of how you want to play something. Did that happen naturally or was a certain production where you felt that you’d reached a new stage? Well, I went to University for three years and that provided a natural break. I was doing the Archers on the radio throughout that, but in terms of filmmaking or television I wasn’t really appearing in anything. I suppose I grew up when I was at University and then when I finished I wanted to get back into acting. It felt like I was starting over again as an adult. How do you keep it interesting for yourself when you’ve been acting for so long? I think the key is making sure that you are being challenged, that you feel nervous. As soon as you don’t feel that way then you’re probably going to be doing something you’ve done before. You need to be pushed and that’s when you’re going to produce interesting work. I think people become complacent when they feel like they’re doing the same thing over and over again. Is that why improvisation appeals to you? Do you find liberating, or is it scary? Oh, I love it. It’s the opposite of scary. I feel like it’s such a good approach to take to other scripts, too. You’ve got to make sure that you’re not just saying the lines for the sake of saying them. It’s why I love working with Drake. We don’t give up until we get to the truth of something. We’re definitely very argumentative and we’ll fall out, but it’s all for the same end so it’s never lasting. It’s so collaborative and we both just want the best for the story. Does ambition factor into the parts you choose? Do you ever think you should do a certain type of role in order to get another one? For me, choosing roles is more about having an instinct towards the character, the story or the director. You’re looking for an affinity with something or for a script to captivate you in some way, because you have no control over how these things turn out. As an actor you’re just one element in the whole thing. You make things that strike you at that time and then the rest is up to the gods. I think that’s why it’s best not to watch your own work. It must be so easy to be disappointed. It is, and that’s why you have to know why you did something. As long as you had a gut reaction to something and you felt it was going to interest you then you don’t get too disheartened when a project turns out differently to how you thought it would. A lot of it depends on where you are in your life at that time. If I’ve been doing a lot of very serious dramas about relationships, say, then I find I want to do something else. I just went and worked on the new Spider-Man film and I wanted to do that because it was a new sort of challenge and not like anything I’d ever done before. Spider-Man couldn’t be further from Breathe In really, could it? Exactly! And that’s what’s great about being an actor. It’s always in flux, and you have the freedom to try different things. You’re not ultimately defining the product; you’re part of it but not the person that controls the edits, so you can flirt with different worlds. I think you have to give yourself up to the flux.